Chelsea Clinton’s Apartment – Hillary’s Hospital – Coercion Code – "Dark Times are upon us"
Website Govtslaves reports, that a Presidential candidate collapses at a ceremony in NYC…and is shoved, unconscious, by SS into a van like a side of beef and rushed off…not to one of the many world-class hospitals and clinics nearby…but to her daughter’s $11M apartment. Sound odd? It did to me. That’s right the SAME address..SAME Floor…only One Apartment per floor. For a woman very secretive about her ambiguous medical conditions…whom avoids hospitals like the plague, it occurred to me that when the Clinton’s bought this incredibly expensive apt. for their daughter in 2013…they may have also purchased it with the intent of using it as a secret private medical treatment facility for Hillary to use during her anticipated campaign. To the press…it would only appear Hillary was just dropping in for a visit with her daughter…when, in reality, she is receiving medical treatment and controlled substances from private physicians and private pharmacists…on private property (no need for disclosure). If so, Chelsea’s apt. served its secret purpose flawlessly this Sunday. It makes sense that to establish a clandestine medical treatment facility in a residential apartment–one which is legally compliant with the controlled substances dispensing/stocking/delivery & shipping requirements…and one which is able to legally supply and treat a private patient with the drugs needed, one would also have to register the address as a medical treatment facility. In this case, I would assume the Clinton Foundation would be the controlling entity. A staff (and private) doctor or pharmacist would then be employed (Hillary has two) to legally treat the patient, practice medicine within the confines of the private residence…and dispense drugs to that private patient without any disclosure. This sham medical facility, while legally registered as a public care facility…would also have to be closed to the public in order to operate without any disclosure. THIS is exactly what appears to be taking place at 21 East 26th Street, 4th Fl., New York, NY. After she had her Parkinson’s “freeze” episode on Sunday, Hillary Clinton was rushed off for medical treatment but not at a hospital. People have been baffled why, when she was completely physically incapacitated, would she be taken to her daughter’s incredibly expensive $11 million dollar apartment on the 4th floor of 21 East 26th Street. Perhaps your question would be answered if you knew that that exact same address was also the home of the Metrocare Home Services health center. Did we just blow your mind? Pharmaceutical billionaire, Martin Shkreli, who lives nearby, was the first to point outthat the address Hillary visited was actually home to a “health center”. 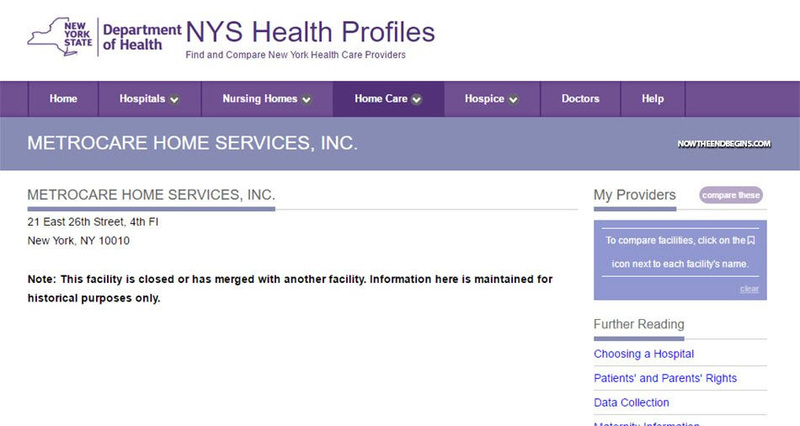 A quick trip to the New York State Department of Health website shows that Metrocare Home Services is closed or has merged with another facility. Ok, kiddies, it’s time to put your thinking caps on now and figure this thing out with me. The luxury apartment building that Chelsea and her husband live in is the epitome of decadence and indulgence. Imagine what it would be like to live in an apartment that spanned an entire New York City block like this one does. And we are to believe that this incomprehensible amount of living space, literally enough for 40 – 50 people, is only occupied by a newly-married couple and their newborn baby? That’s the equivalent of using a football field as a play area for a single child. But what if the space was needed for more than Chelsea’s little nascent family? Now imagine, if you will, how much room would be needed for the world’s most visible and infamous politician who not only is running a campaign for president, but also sick with a variety of illnesses and diseases and requires a full-time medical staff to keep her up and running. So now he have Hillary, Bill, a dozen Secret Service agents, various handlers as well as Hillary’s full-time doctors and nurses. Her medical attendants needs a place away from prying eyes to conduct the needed medical treatments to manage her Parkinson’s Disease, blood clots, and the repercussions from her brain injury. What better place to have to do all that than an entire medical facility that conveniently has “merged with another facility”. Now suddenly, having such a massive apartment block makes perfect sense. It’s not an apartment for the newlyweds, it’s a secret medical compound for treatments done in private. That’s why the catatonic Hillary was rushed there and not to a general hospital. She has her own secret hospital facility, and it’s hidden right in plain sight. If not for the mobile phone video from Sunday, none of this would ever have come out. May have been listed as daughter’s resident, but Hillary paid $11 million for the 4th floor, takes up a whole block. This is her private medical facility , with nurses, couple of doctors on staff all the time, plus she has other part as her luxury apartment. She did this, way before she announced her running. This might have been in 2014. As in 2015, surgery behind ear, was done at private medical facility, is there is where she went .